Tucked away in the profound truth that God came to us is an even more astounding truth that He came as us. John 1:14 So the Word became human and made His home among us. Our thoughts of Jesus are usually filled with His teachings, wisdom and miracles. We tend to focus on His divinity. But while Jesus was fully God, He was also fully man. He had a human body and human emotions, just like us. The Bible gives us a lot of insight into His human experience and shows that He subjected Himself to choices, difficulties, trials and heartaches by choosing to become a human. God came as us and faced the everyday commonalities of humanity. He lived the full human experience. Hebrews 4:15 says that He ….understands our weaknesses, for He faced all of the same testings we do….. And Hebrews 2:14 and 18 says ….it was necessary for Him to be made in every respect like us…. and Since He Himself has gone through suffering and testing, He is able to help us when we are being tested. He came as us to be like us in every way. As a human, Jesus faced everything we face. He endured everything we endure. He encountered all the same struggles we encounter. Whether He lived it as a human or felt it on the cross, there is not one thing that we will ever experience that He did not also endure. He did not come as us in order to figure us out. He did not come as us in order to understand us so He could relate to us or know how to help us. He did not come as us that He could determine how to handle us. He did not come as us for His education or benefit. He came as us so that WE would understand that He DOES know us, does understand us and can relate to us. He came as us so that we could understand He is not a distant and un-involved God who is ignorant of our feelings, thought processes and experiences. He came as us to show us that He is very personal and relates to every situation and experience we could ever find ourselves in. He came as us so that we would trust Him and follow Him to God. Christmas is the most wonderful time of the year. My family enjoys this season more than any other. We put up trees, string lights and wrap gifts. We listen to Christmas music and watch cheesy Christmas movies. We plan and attend parties and events. And there is no shortage of Christmas goodies and eggnog in the Wahl home. Sometimes, I get so caught up in the fun of the season that I lose sight of its purpose – to celebrate the truth that God came to us. What a profound thought: God came to us. God – the eternally omniscient, omnipotent, omnipresent, Creator of the universe – came to us. 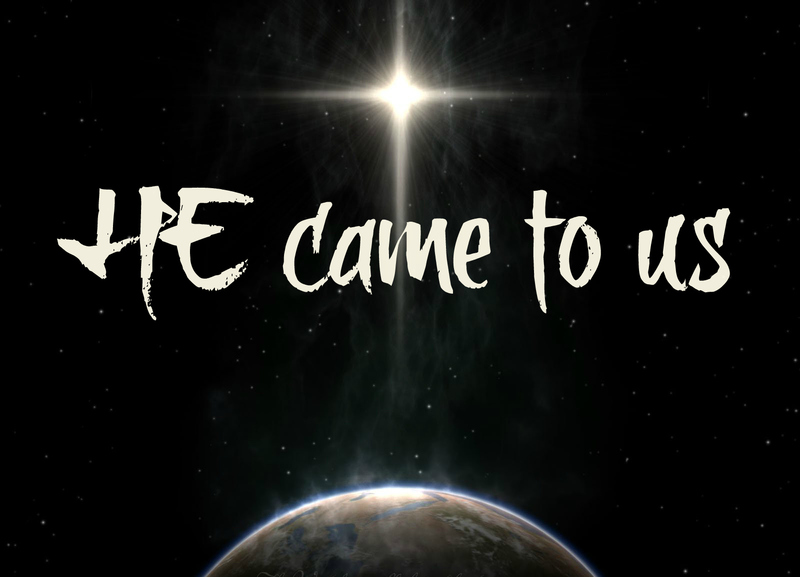 The One who hung the stars, came to us. The Ruler of the ages wrapped Himself in dirt and came to earth. He did not send an emissary, ambassador or representative. He did not send an angel or other created being but He came to us Himself. We were not summoned to Him. He did not insist that we figure out how to get to Him or require us to create a path to Him. He did not demand that we find a way to Him. Instead He came to us. He came to us because we could not go to Him. Sin had created an abyss between humanity and God, separating us. It was impossible for us to cross this chasm. So He came to bridge the gap. He came to us because we could never do enough, give enough or be enough to make a way to Him. Nothing we could do would change the separation from Him. So He came to give all He is and be the final sacrifice for sin so that we could know Him. He came to us because we could never find the way. We were hopelessly lost, wandering aimlessly, trying every path we stumbled across in hopes of finding Him. So He came to show us the way by becoming the Way. Shrouded in darkness and hopelessly blind, we had no hope of ever finding God. So in His great love and compassion God came to show Himself to humanity, revealing Himself through His Son, Jesus Christ. In John 14:9, Jesus says Anyone who has seen Me has seen the Father! God came to us in Jesus. It’s the story of the Bible – God reaching out to man. Every page, every chapter and verse is the revelation of Jesus: God coming to us. It’s the miracle of the ages. The unexplainable phenomenon of the universe. The wonder of all time. It’s what makes the most wonderful time of the year so wonderful. God came to us. I enjoy all the fluff of Christmas. But I never want to lose sight of the true wonder of Christmas – that God came to us.